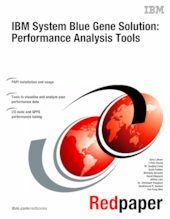 This IBM® Redpaper publication is one in a series of IBM documents written specifically for the IBM System Blue Gene/P Solution. The Blue Gene/P system is the second generation of a massively parallel supercomputer from IBM in the IBM System Blue Gene Solution series. The first section of this paper provides an overview of the Performance Application Programing Interface (PAPI). In this section, we describe the Blue Gene® implementation of PAPI and usage. The second part of this paper gives a detailed description of the IBM High Performance Computing Toolkit for the Blue Gene/P™ system. Included in this section is a discussion of the MPI Profiler and Tracer™ , CPU profiling, the Hardware Performance Monitor, and the Modular I/O library. The final section of this paper gives tips for tuning I/O performance and the IBM General Parallel File System™ (GPFS™ ).